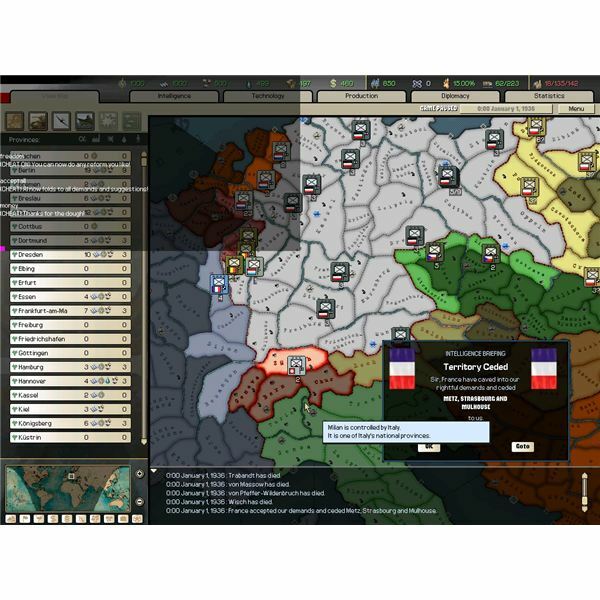 Hearts of Iron 2 is perhaps the best of the Hearts of Iron series, a product of Paradox Interactive that lets players take charge of virtually any historic nation that existed between 1936 and 1953 and lead it through some of the most tumultous years of human history. 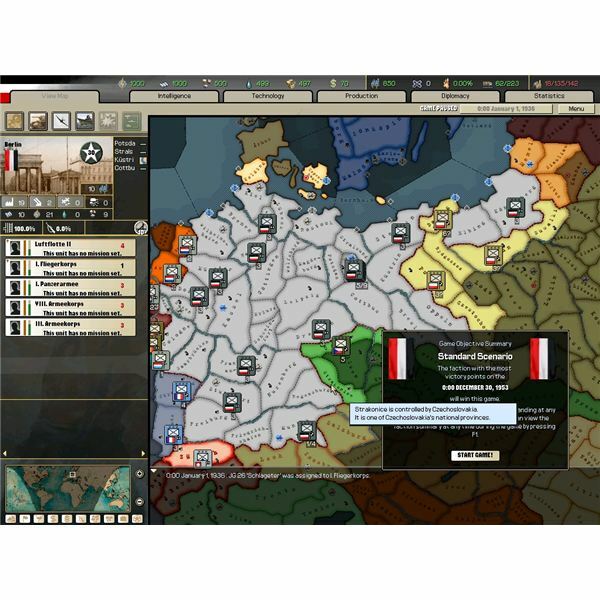 Hearts of Iron 2 cheats, triggers, and other tweaks let users have an extremely high degree of control over the course of the game, which lets the starting conditions of the world in 1936 be radically altered to suit personal tastes. Because of this customizability and the strategic focus, HOI 2 is a very different animal from other World War 2 strategy games like Blitzkrieg or the Panzer General series. 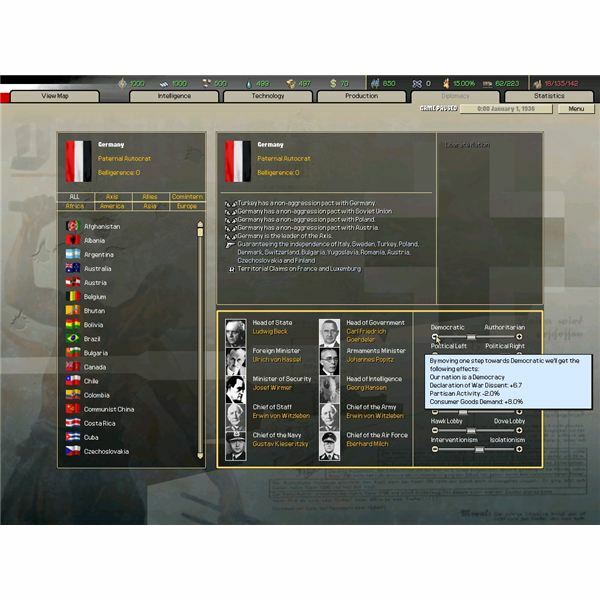 This customizability means that Hearts of Iron 2 (Note: I automatically include the Doomsday expansion as integral to the base game throughout this article) is suitable for simulating the possible course of history after making whatever changes best suit the player's vision for how the world could have been in 1936. 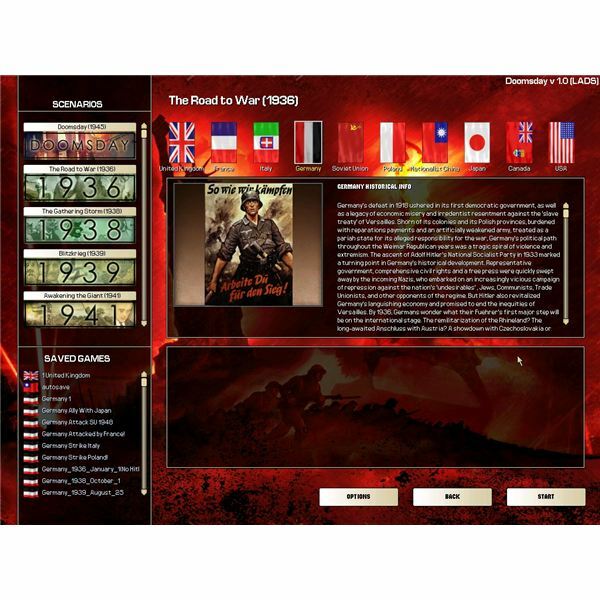 While Hearts of Iron 2 is inherently going to lead players down the path of an alternate history (even if the player chooses to follow actual history, the AI might not) there is a tendency among enthusiasts of the Second World War grand strategy genre to adhere fairly closely to historic events, perhaps making changes only to suit their curiosity in regards to "what if" scenarios. These might include "what if Japan had not attacked Pearl Harbor?" or "what if Germany had invaded Britain in 1940?". Many others choose to merely test their ability to win campaigns for the side that historically lost. But while it can be a fun challenge to see if you can successfully defend Poland in 1939 against the German onslaught, there is another way to play. Let's play Hearts of Iron 2 as a true simulation of alternate history, and completely change the starting state of the whole world. Hearts of Iron 2 cheats are plentiful, and while some are useful for giving a country more cash, or, apparently, instigating an alien invasion, others can be used in conjunction to totally alter the world's composition in 1936. Of these, the most powerful may be the event triggers. 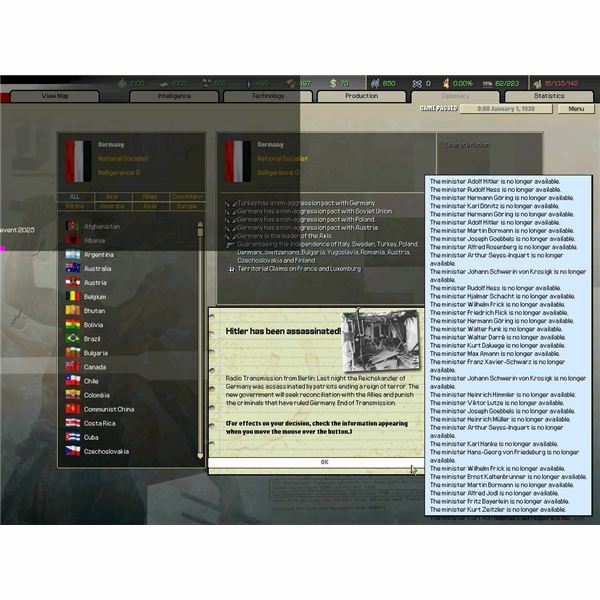 Events in Hearts of Iron 2 are scripted events that take place either when certain preconditions are met or randomly throughout the course of the game. Examples of the former are things like the Munich Agreement, where Britain and France agreed to let Germany annex the Sudetenland, a part of Czechoslovakia occupied largely by ethnic Germans, and the latter are represented by military parade events or elections resulting in a change of government. These events set certain boundaries to the overall course of a standard game while preserving some randomness. If a player wants to go through 1936-1953 while adhering to the historic path of their chosen nation, simply choosing the historical option when the event triggers facilitate this ambition. All the events will have the same basic structure, and the four digit number that appears after the text id = is the event code. In this case, an event for moving the capital of the Netherlands, the id is 2810. For clarity, after opening the console enter the following text and hit enter to trigger this event. All other events can be triggered in the same manner. Now that we've got the cheat panel out of the way, let's play Hearts of Iron 2 with a few big tweaks. First off — kill Hitler. And it will be done. Germany's government will remain a dictatorship, but be cleansed of the prominent Nazi leaders both in the military and government. History will definitely be different after that! When "Hitler is… out of the way" (c'mon retro gamers – where did I take that line from? Hint: think Command and Conquer Series) it's time to make whatever changes you want to see in the world. One notable aspect of Hearts of Iron 2 is that you can save the game, exit, and come back into it playing another country. So long as you always keep the game paused while making changes, time won't pass and you won't lose game days. Customization options are wide open from here on in. One way to make an interesting map variant is to enter the game as each power that currently holds colonies and then liberate all that can be liberated — then free them from their liberator's control by ending their status as puppets. Especially if done with the British Empire, Italy, and France a whole slew of new nations will be formed across the map. While most will have only minor militaries, their independence changes the game significantly and makes it harder for, say, France to carry on a war by retreating to its colonies. Temporarily activated Hearts of Iron 2 Cheats can completely change the pace of a game even without drastically altering the number of starting nations. For example, opening up the chat console and typing in "acceptall" makes the AI accept any proposed economic or diplomatic deal. "freedom" allows any of the sliders under the diplomacy panel that deal with your chosen nation's governmental policies to be moved at will. Want to have the United States start 1936 as a dictatorship aligned with Japan? Combine acceptall and freedom to change the US government and force the AI to accept an alliance between the US and Japan. Want to forge a pan-European alliance set up to fight the Soviet Union? It can be done. Want to create a grand alliance between the United States and the Soviet Union to rule the world? Again, the cheats let you play Hearts of Iron 2 as desired. provinces that house the Maginot Line and the rich province of Luxembourg as well. Triggering events such as the Reoccupation of the Rhineland, the Anschluss of Austria, the Munich Agreement, the End of Czechoslovakia, and The Molotov-Ribbentrop Pact along with demanding territory from Poland will bring Germany very close to beginning 1936 with all of its territory from 1914, plus Austria (which had considered joining in a Greater German nation in the past and could do so again). By also triggering events such as Demanding Danzig in conjunction with the Poles Fold response (which accedes to the German demand) and, of course, the Assassination of Hitler, Germany can begin 1936 almost as strong as it was in 1914. This completely changes the balance of power in Europe, and means that Germany can begin a huge rearmament project immediately. This opens up intriguing historic possibilities — a war to liberate colonial possessions from Britain and France? An early assault on the Soviet Union through Leningrad? Expanding the Axis to include all of Europe that isn't part of the Allies? The possibilities are endless, and the revamped German scenario is only one of an infinite number of alterations to history that could be made. So rather than playing through HOI 2 with the same old setup intact, why not play Hearts of Iron 2 a little differently, and see where things end up in 1953?